East European countries worry taking refugees is socially disruptive and provides no benefit in closing the income gap with Western Europe. Britain is the top destination because educated East Europeans tend to be fluent in English, while their German is deficient. Central Europe and the Baltics have reached 60% of West European income levels. Only the Czech Republic, Slovakia and the Baltics will reach 80% of West European income levels by 2035. Poland is the only European economy to have registered 25 consecutive years of economic growth. Its GDP has doubled since 1990. Eastern Europe has an immigration problem, but not the kind you might expect. Since regaining freedom after the Berlin Wall came down 27 years ago, post-Communist Europe from the Baltics to the Balkans has lost 15 million people, 13% of the population. Most of the decline is due to emigration, as the young and educated have sought better incomes and opportunities in Western Europe. In some countries, the demographic problem is extreme. Lithuania’s population has fallen by 25%, Romania’s by 17%. The European Union Commission reports that in 2016 Lithuania’s population decline was the steepest in the EU, followed by Latvia, Bulgaria and Greece. To date, the United Kingdom has overwhelmingly been the preferred destination, a reality that will certainly change as Britain leaves the EU in 2019. As of now, there are 831,000 Poles in Britain, the country’s biggest cohort of foreign-born residents. Keith Crawford, a professor at Prague’s Charles University, says Britain is the top destination because educated East Europeans tend to be fluent in English, while their German is deficient. In addition, says Crawford, Britain was the only large EU economy that permitted full labor market access to the new EU member states upon their accession in 2004. Germany and France didn’t open their labor markets until 2011. Despite losing significant levels of their own population, Eastern European countries continue to oppose inward migration. A Gallup survey in May indicated that 70% of Hungarians oppose taking in refugees followed by smaller majorities in Macedonia, Slovakia, Latvia, Bulgaria and the Czech Republic. Not surprisingly, politicians in the post-Communist countries are frustrated with the slow pace of narrowing the income gap with Western Europe. When workers at the giant Volkswagen plant in Slovakia went on strike in June, winning a 14% pay increase, Prime Minister Robert Fico sided with the strikers. He complained that Slovaks are paid one-third of what VW workers in Germany earn doing the same tasks. Further proof that income convergence is not occurring, as Professor Crawford at Charles University observes, is that accountants and teachers from Poland have chosen to take menial jobs in Britain. The London-based European Bank for Reconstruction and Development estimates that Central Europe and the Baltics have reached 60% of West European income levels. But it projects that only the Czech Republic, Slovakia and Baltics will reach 80% by 2035. In short, East European incomes may never catch up. Even so, Poul Thomsen, the International Monetary Fund official in charge of Europe, says post-Communist Europe has registered “astonishing progress” since 1990. Income levels in a dozen lands from the Baltic to the Adriatic are 50% higher than in 1989. The Baltic states and Poland are the biggest winners. Poland has been the fastest grower of all EU members in recent years. 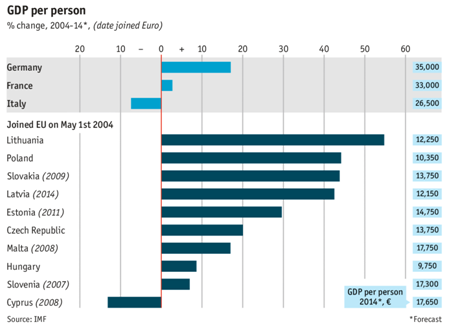 It is the only European economy to have registered 25 consecutive years of economic growth. Poland’s GDP has doubled since 1990. In the first 15 years of transition, economic growth in Eastern Europe was often double the pace of Western Europe. Since the great recession, however, growth has slowed and forecasters now assert that labor shortages and structural rigidities are constraining growth by up to 0.5% annually. Their obvious concern, however, is that – even if they were willing to move politically and become more open-minded — they are unlikely to receive the migrants with the skills in short supply. Skilled refugees are much likelier to be absorbed in the German labor market. Taking in low-skill refugees, the CEE countries believe, only further worsens their ability to catch up with Western countries on incomes. Thus, it is not only the often-cited cultural and/or religious argument, but the labor market dimension that gives East and Central European governments reason to resist the EU’s attempts to have them share in the refugee burden. Despite new fault lines from nationalism and emigration, there is little sentiment in Eastern Europe to follow Britain and withdraw from the EU. Simply put, the east derives too many benefits from the EU– from free movement of labor, market access, investment and the inflow of foreign assistance.